Tips Alert: Reliance JioPhone pre-booking: Here's how you can get the 4G VoLTE feature phone. Reliance JioPhone pre-booking: Here's how you can get the 4G VoLTE feature phone. Reliance Jio has resumed sales of its ambitious JioPhone. 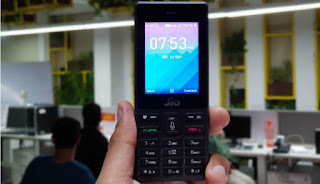 According to a report by The Economic Times, the telecom company has started sending messages to customers with a link attached to buy the advanced 4G VoLTE feature phone. The link has a code which the customer needs to show at the nearest Jio outlet to get the phone. In the first phase of sales, Reliance Jio managed to sell around 6 million of Jio phones. Now, the company is targeting close to 10 million customers in the second phase who had shown interest in the phone but could not get it after the device went out of stock. Mukesh Ambani, owner of Reliance Industries (RIL), launched JioPhone in July this year. The company started taking pre-orders for the same in August. However, due to unprecedented demand for the JioPhone, which led to the deliverers being pushed to October 19. For those who are unaware, the 4G-enabled feature phone is priced at Rs 1,500 which is refundable after a period of three years given users return the device. Those who pre-book the device will have to pay Rs 500 upfront and the rest Rs 1,000 at the time of delivery. As for specifications, JioPhone offers smart features like a voice assistant, the ability to support Jio apps like JioTV, etc. It gets a 2.4-inch QVGA display and this is a single SIM phone. The phone also supports a microSD card slot, FM Radio, torchlight, and SOS option. There’s also a 2MP rear-facing camera and a 0.3MP front camera. The processor is dual-core SPRD 9820A/QC8905 one and there’s 512MB RAM onboard, coupled with 4GB storage, which is expandable to 128GB. The device is backed by a 2000mAh battery inside.